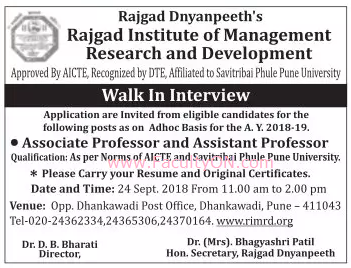 Rajgad Institute of Management Research and Development, Pune has advertised in the LOKSATTA newspaper for the recruitment of Associate Professor / Assistant Professor jobs vacancies. Interested and eligible job aspirants are requested to walk-in on 24th September 2018. Check out further more details below. About College: RIMRD seeks to develop the knowledge and imagination of the students to enable them to take up leadership positions in the highly competitive organizations of tomorrow. At present we have Masters of Business Administration course, which is approved by AICTE New Delhi and affiliated to Pune University. We have achived ISO 9001:2008 from first batch. How to Apply: Interested and eligible candidates are requested to attend the Walk-in interview along with originals & copies of certificates / testimonials and latest PP size photos to the following walk-in address.